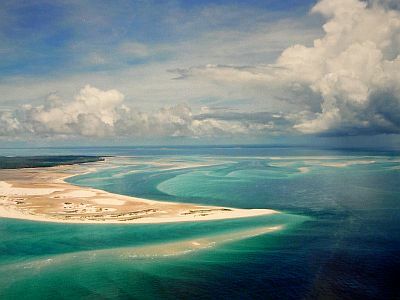 The climate of the Bazaruto archipelago, located in the south-central part of Mozambique, is tropical, with a hot and rainy season from November to March, and a dry season from April to mid-November, within which there's a cooler period from mid-May to mid-September. In the coolest months, June and July, the average daily temperature drops to around 20 °C (68 °F): in fact it is winter, but we are close to the Tropic, so the temperature does not decrease too much. The annual precipitation amounts to about 870 millimeters (34 inches), so it is not very abundant; only from December to February it rains more than 100 mm (4 in) per month. Occasionally, however, there can be brief showers also in the dry season. Declared national park in 1971, the archipelago comprises the islands of Bazaruto, Benguerra, Magaruque, Banque and Santa Carolina (or Paradise Island). On the islands, there are sandy beaches and coral reefs. From November to mid-May, the archipelago can be affected by South-West Indian Ocean cyclones, although they are more likely from January to March. The amount of sunshine in Bazaruto is good all year round, even in the wettest months, since the rains come as downpours or thunderstorms, which may be intense, but do not last long. The sea is comfortably warm in summer, when it reaches 28 °C (82 °F) from January to March, while it is still warm enough to swim in in winter, in fact it does not drop below 24 °C (75 °F) in July, August and September. Here are the average sea temperatures. The best time to go to the Bazarutos runs from mid-May to October. In April and the first half of May, there is already little rain, the temperature is high and the sea is still warm, but there is still some risk, though not high, of cyclones. From June to September it's often a bit cool, especially in the evening, actually sometimes at night it can even get a bit cold, and the temperature can reach 10 °C (50 °F): it's better to bring a sweatshirt or sweater and a pair of long pants. However, from July to September, in the southern part of the Mozambique Channel you can watch humpback whales. Anyway, in terms of climate on the whole the best month is October, followed by September, which is already a bit warmer than August. In October, the days are also a little longer: one hour more than in August and two hours more than in June.